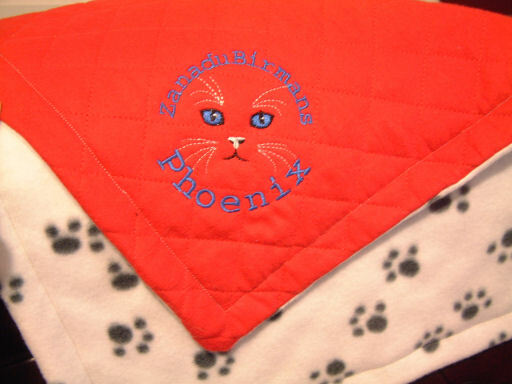 Our Cat Nappers are double sided, with fleece on one side and quilted cotton on the other side. 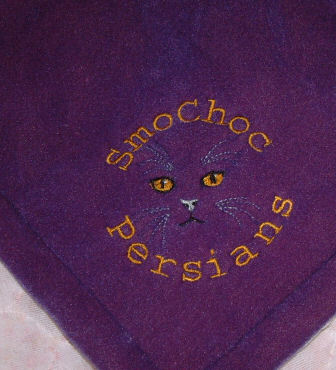 Generally the embroidery is done on the plain side. 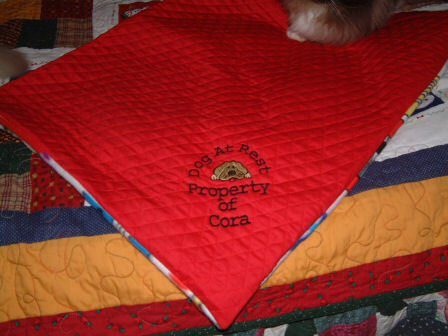 You may have yours personalized with your pet's name or a saying of your choice, or choose from one in stock. We offer Cat Nappers in a variety of sizes. The most common size is about 18" X 22". Folded in half this fits most cat carriers. Opened up it offers your cat (or dog) its own blanket suitable for bed or as a cover on furniture. For those who exhibit cats, personalized cat nappers identify your star to the public when placed in your benching cage. Shown is a Large Dog Napper prior to border sewing. Available in a variety of fleece prints, solids with quilted cotton generally solid color, but occasionally quilted side is available in print. I also have a small supply of quilted cotton flannel available for that especially warm and cuddly feeling.